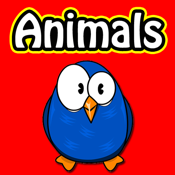 Learn 45 Animals with Real Animals Pictures in Nature through Write & Play with fun dancing letters spelling, tracing, and drag & drop puzzles. 1) Write: Trace the words of the animals while learning the spelling, the pronunciation, and the image association of the animal. 4) Touch the "Spell" button to see jumping and dancing letter spelling animation. 7) Change the letter case by toggling the case "Switch to Lowercase" or "Switch to Uppercase"